A peppery soup that will warm you on those cold windy days! Horseradish – you either love it or you hate it. There is usually not a way in-between! The peppery taste can be quite overwhelming, but if you use just the right amount you get a little hint of spiciness and that unique flavor that you can only find in horseradish. Growing up in Germany I encountered horseradish usually only as a topping for graved lax on bread. However, there is a more traditional way to put it to culinary use – as horseradish soup. 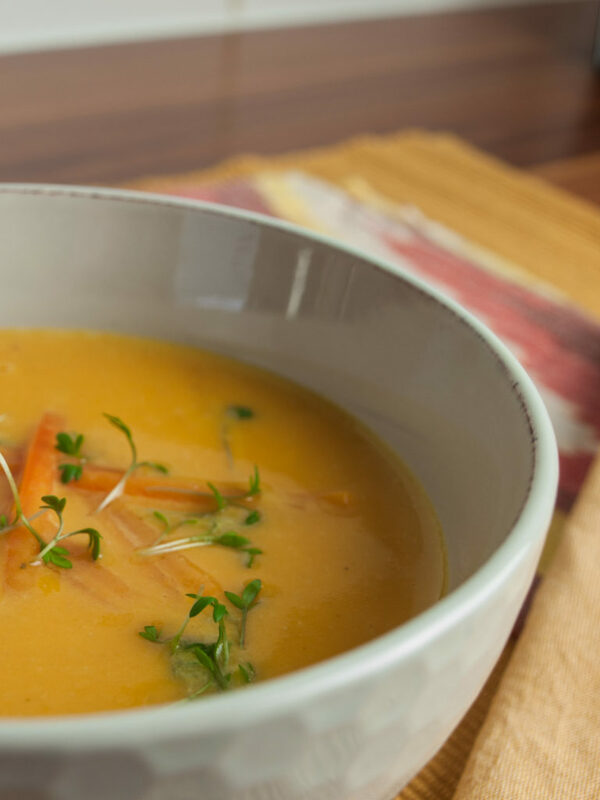 Thick, hearty and piping hot soup – just like my grandma’s generation used to make it! Inexpensive, easy to make, vegetarian and heart-warming. Perfect for those cold and windy spring days we are still dealing with here in Amsterdam at the moment. Traditionally this horseradish soup would be made with regular potatoes. My little modern twist on it is using sweet potatoes. These may not have been available to my grandma’s generation but are easy to come by today. It not only gives it a touch more color, but the sweetness mellows out the spiciness of the horseradish giving you rounder and more balanced flavor. Trust me, this soup will win over you, your friends, family, kids and elders alike! If you never tried horseradish before, give it a try with this recipe! I actually did a video shoot with the lovely Angelica from AsSoupAsPossible in which i cooked this dish. She asked me to do an interview about my love for food, my upcoming cookbook and foodie stuff in general. The video interview will be released soon and of course I’ll let you know all about it then! Peel and dice the onion. Put a pot on medium high heat, add butter and diced onion. Sweat onion for 5 minutes until it’s translucent and starts to brown. Meanwhile, peel the sweet potato and cut into 1x1cm cubes. Add sweet potato cubes to the onion and add vegetable broth. Bring to a boil, reduce to a simmer and cook for 20 minutes. Peel carrots and cut into thin ribbons or match sticks. Once the sweet potato finished cooking, blitz the soup until smooth. Add cream and cut carrot. Bring to the boil once more and simmer for 2 more minutes. Stir in horseradish, lemon juice and a pinch of each sugar, salt and pepper. Taste and adjust seasoning if needed. Spoon soup into bowls and garnish with either cress or chopped chives! Get your spoons out while it’s still warm! Let me know in the comments what you think of the recipe! Do you love or hate horseradish? Have you ever made soup with it before or think this recipe needs another key ingredient? Leave your comment and help to make this even better! Next Post A fun week in Berlin with currywurst and other delicacies!